The Ponderosa fire, which has moved through 23-square miles of wooded land near Redding, Calif. has forced thousands of residents to evacuate their homes. NBC's Brian Williams reports. As a flurry of wildfires rage across the Western United States, firefighters on Monday were trying to gain control of the 15,000-acre Ponderosa fire in Northern California that began over the weekend. Firefighters have only been able to contain five percent of the blaze, which is burning across both Tehama and Shasta counties. The fire began on Saturday after lighting strikes hit the densely forested area about 170 miles north of Sacramento, according to The Associated Press. So far, it has engulfed more than 23 square miles near the Northern Californian towns of Manton, Shingletown and Viola, AP reported. Seven structures have been destroyed. At least 3,500 homes are under threat Monday, according to The Redding Record Searchlight. The fire forced the closure of Highway 44 and some local roads and prompted the sheriff to declare a State of Emergency for Shasta County. The Red Cross set up an evacuation center in Redding. Blazes in multiple states threaten houses and cause evacuations. John Cluff, 42, told the Redding Searchlight that he was forced to flee his home before the evacuations were issued. He went back for his dog about 3:30 p.m. "The fire basically chased me out of the property," he said. "All I could see was black smoke and flames." As the fire expands to the east and west, shifting wind direction in the afternoon hours poses a challenge for firefighters. 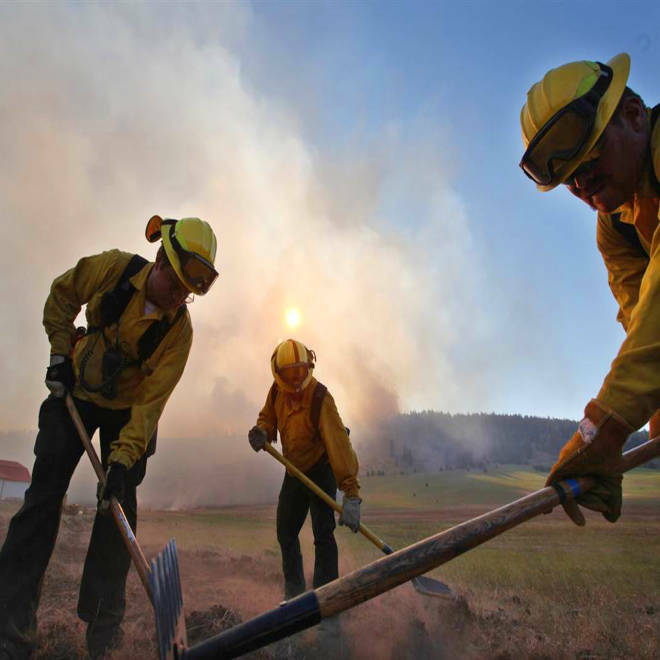 An additional 435 firefighters joined the battle on Monday, bringing the total to at least 1,409 firefighters, the Record Searchlight reported. Additionally, 122 fire engines, 2 helicopters and 47 dozers are helping out. Wildfires are also burning all across the rest of the West. Good weather over the weekend helped firefighters battle the 23,225-acre Taylor Bridge Wildfire about 75 miles east of Seattle, near Cle Elum in central Washington state. Thought it was only 47 percent contained on Monday, authorities expect to have full containment by Tuesday, Seattle's NBC-affiliate KING 5 reported. About 60 homes still remain threatened by this fire, which began on Aug. 13. It has already destroyed 48 homes and 15 outbuildings. So far, the Taylor Bridge Wildfire has cost an estimated $6.4 million to fight, KING 5 reported. About 1,100 firefighters are working to protect around 350 homes threatened by the Trinity Ridge Fire on Monday, NBCLosAngeles.com reported. The blaze is threatening the mountain town of Featherville, Idaho, about 50 miles east of Boise. Officials say this fire is expected to reach the Featherville area, where residents evacuated on Saturday due to "imminent danger." The Trinity Ridge fire, which is only five percent contained, has burned more than 90,000 acres, The Idaho Statesman reported.